If you're in Tokyo and you are craving MEAT, you're in the right place. Japan is the home of "yakiniku"
where you cook your own meat in front of you. You get your choices of dipping sauce, and other side menus you can choose from. 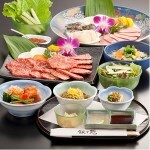 Out of all the popular yakiniku restaurants, Jojoen is a very famous one with great quality meat. We recommend you try the one in Roppongi.